How Much Should Restaurants Pay Employees? It’s tough out there. 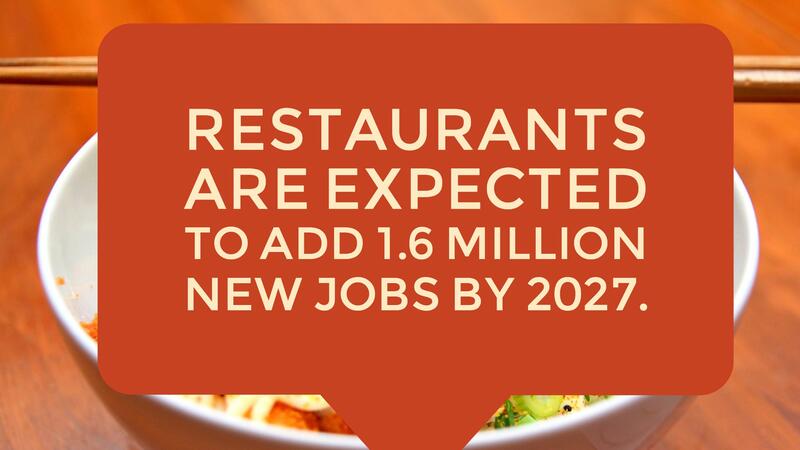 But, in spite of it all, according to the National Restaurant Association (NRA), restaurants are expected to add 1.6 million new jobs by 2027. With the rise in openings, competition for restaurant employees is fierce, and the number of available workers per position is at a 15-year low. In today’s environment, finding the right talent is a battle of margins and manpower. So, how can you give your restaurant an edge? Well, one of the most popular tools for attracting and retaining talent is compensation, which primarily includes hourly wages or a salary. Who Gets Paid Hourly and Who Gets Paid a Salary? Traditionally, whether an employee is paid hourly or given a salary has been determined by their role. Managers and chefs are often salaried, while most other workers are hourly. Of course, the water gets more muddied when you factor in tipping for front-of-house roles versus non-tipped wages for roles in the back of the house and overtime regulations. There are a number of factors that go into setting a salary or hourly wage. While labor laws set the fundamental parameters, you also have to take into account the nature of your business — for instance, how much a specific role contributes to your customer experience as well as what’s simply economically feasible. What Wage and Hour Laws Should You Know? It’s important to know that, depending on where your restaurant is located, there can be federal, state, and even local labor laws that determine minimum wage and overtime. The Fair Labor Standards Act (FLSA) sets the federal (national) standard for minimum wage and overtime, which are $7.25 per hour and time and a half after 40 hours in any workweek. However, most states and several cities/metropolitan areas also have their own minimum wage and overtime laws — and, in most cases, employees are entitled to the higher rate of pay and additional overtime regulations, like time and half after eight hours worked in a day. The tip credit is another component of the FLSA that lets restaurants pay tipped employees a minimum cash wage (below the national minimum wage), while allowing for tipped income to make up the gap by either reaching or exceeding minimum wage. The current federal minimum cash wage is $2.13 with a maximum tip credit of $5.12 per hour, which combined equals $7.25. Employers using the tip credit must be able to prove that the employee earned at least minimum wage through a combination of the minimum cash wage and any tip credit contributed by the employer. 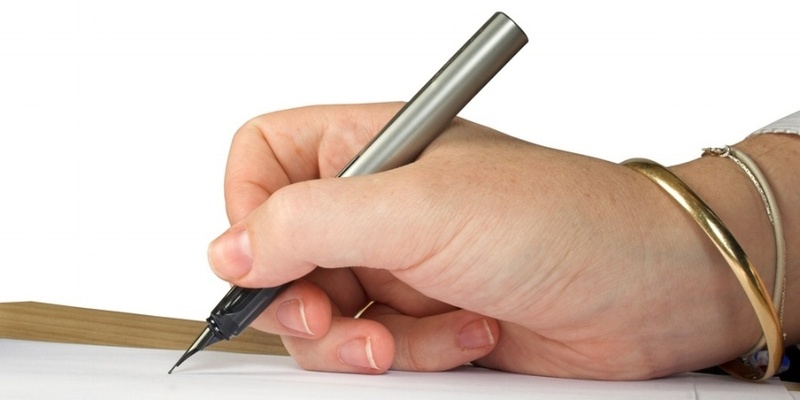 Like minimum wage, many states and several cities have their own legislation. Often, if the minimum wage is higher, the minimum cash wage and tip credit will also be higher. Seven states, Alaska, California, Minnesota, Montana, Nevada, Oregon and Washington, don’t allow the use of a tip credit. Instead, they require that tipped employees be paid minimum wage plus tips. In an article for Entrepreneur, executive and entrepreneur coach Stever Robbins outlines a process for setting salaries. He advises that you start by determining the highest salary that you’re willing to pay by looking at whether the position helps drive growth or if it’s a support role that, if done well, can create efficiencies. Both matter, it’s just a factor of where it all fits in the big picture for your business. After that, you flip the coin and consider the lowest amount you’re willing to pay. This is where you can use online tools to determine the market rates for specific roles. Payscale gives you a top-down view by consolidating data across the restaurant industry as a whole (you can even request a free report), while Glassdoor and Salary.com get more granular by pulling salary ranges within a specific location. You can also go low tech and reach out to other business owners in your community to find out how much they pay their employees. And last, but not least, consider the individual. There is a human factor in all of this. It’s very hard to put a price tag on it, but it matters. Does Paying Above Minimum Wage Has Made a Difference? Using the fast food industry as an example, both Sonic and McDonald’s have begun paying workers at corporate-owned stores more in order to gain a competitive advantage by being seen as more attractive and desirable employers. So far, the results are positive. 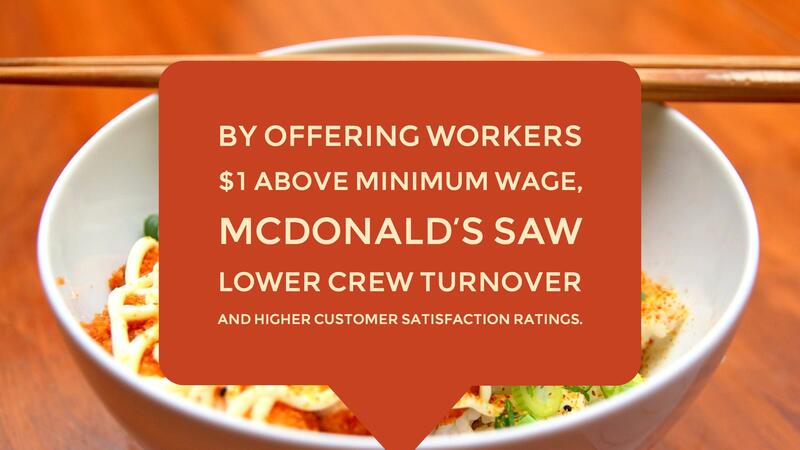 By offering workers $1 above minimum wage, McDonald’s saw lower crew turnover and higher customer satisfaction ratings. In-N-Out Burger is known for paying well above minimum wage and it’s one of the most recommended restaurants in the United States. Along with strong word of mouth among customers, it’s also rated highly as top place to work. Yup. In fact, a survey of 80 senior business leaders found that 95% feel that company culture affects consumer purchase decisions. Businesses ranked with the worst customer experiences are also considered the worst places to work. Then there’s the evidence presented by a recent Harvard Business School study, which found that raising minimum wage actually weeded out the weaker performers in restaurant space. 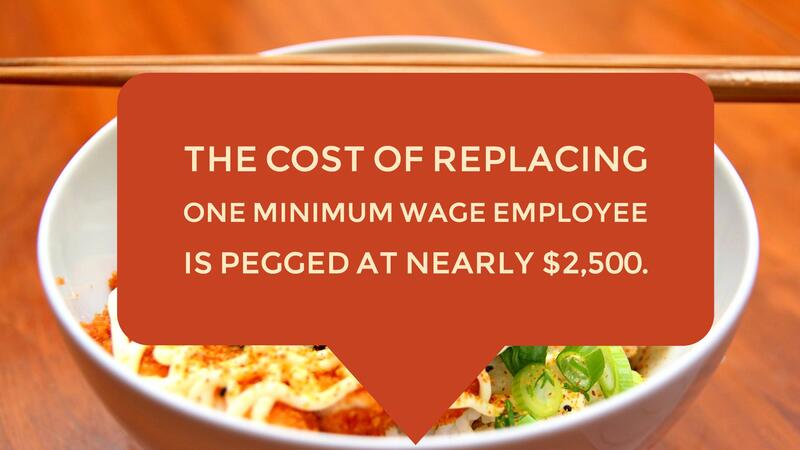 Meanwhile, restaurants with high approval ratings showed no impact from the wage increase. What Does it Cost Me if Someone Quits? If you consider how much it costs to train a replacement, losing an employee costs an employer 16% the former employee’s total first-year compensation. If this person was paid minimum wage, the cost is pegged at nearly $2,500. 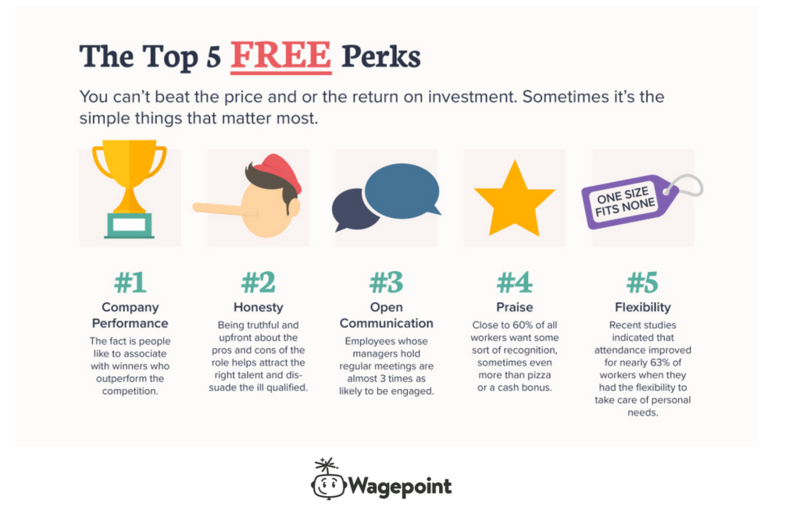 What Else Can I Offer On Top of Competitive Wages? Provide flexibility — This is an area where technology can help. Tools like Deputy, TSheets, When I Work, and 7Shifts make it simple to schedule, track time. and even trade shifts using a smartphone. Many of these tools also integrate with your point of sale (POS), payroll, and accounting software — saving you time and increasing your own flexibility. Again, it also goes back to valuing your employees. If someone’s a good worker and all it takes is a little flexibility to keep them on your team, it’s a no-brainer on what you should do. Show that you understand — It’s becoming a mobile world. If you’re not using mobile tools, like Snagajob, for your hiring, you’re missing an entire pool of candidates. Consider this statistic: 72% of workers use their mobile phones to find work — however, only 54 % of employers post jobs that can be applied to on a smartphone. Create a culture of growth — Another piece of sage advice is to foster it from within on a daily basis. Building a growth culture starts from day one with onboarding, training, open communication, and more. Get creative — If you’re concerned about pay differences between the front and back of house, consider tactics like getting rid of tips, revenue sharing, or even a service charge. 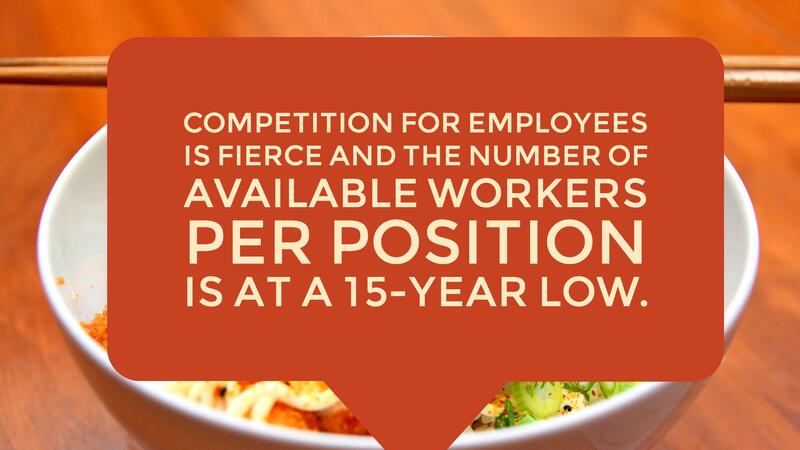 As the employment environment changes, many restaurants are more willing to think outside the box, it may take a bit of training and adaptation on you, your customers’ and your staff’s behalf — but, in the long-term, it just might benefit everyone as a whole.